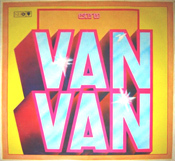 Los Van Van -- LVV's Volume V had some odd disco and R&B torch-song experiments, but also some great tracks. El Tosco's wrote his first song for LVV, but the real event here was the auspicious composing debut of César "Pupy" Pedroso. He clearly already had his "tumbao pega'o" with his first two songs, Con el bate de aluminio and Tal como empezó [source for both]. 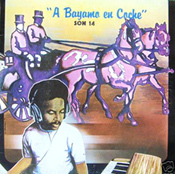 Son 14 -- In the 70s, Van Van, La Ritmo, and Aragón breathed new life into the flute and string-based charanga format, but the horn and bongó-based conjuntos, led by Rumbavana, were also gradually modernizing. Rumbavana, founded in 1956, specialized in aggressive new versions of son montuno classics, but they also recorded originals and one of their composers was a young pianist by the name of Adalberto Alvarez. In 1979, Adalberto founded Son 14. The opening seconds of Bayamo en coche [source for all], make it obvious that something new and exciting is afoot. In the next audio excerpt from the title track, listen carefully to Adalberto's piano tumbaos. They do more than just keep time and fill out the chord progression -- they respond to specific elements of the arrangement - an extremely important precursor of timba piano playing. This addictive chord progression would later be used on some of the greatest hits of Revé and Manolito. Finally, note the melodic influence of the line "yo quiero ir a Bayamo" on the last phrase of this 1994 Charanga Habanera excerpt. 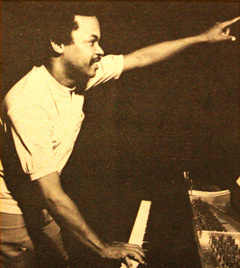 The second track, El son de la madrugada, later recorded by everyone from Omara Portuondo to Gilberto Santa Rosa, set Adalberto on a path that would result in him being one of the most covered Cuban songwriters since Arsenio Rodríguez. Also note that by adding trombones, Adalberto broke with the traditional format of the conjunto. When we get to 1985 we'll see that he had one more important orchestration trick of his sleeve.